The family name puzzle is a great way to surprise the people you love. 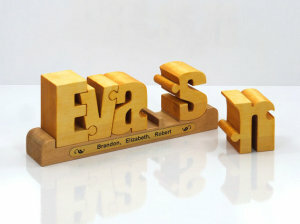 The family name puzzles are handmade from pine wood. They are polished and look amazing. You can add a personalized message to the puzzle. This personalized message will be engraved on a metal band with a laser. The gift is perfect for every occasion. Surprise the people you love with this amazing present. 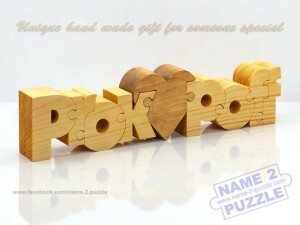 If you wish you can have the two names of someone special handcrafted from pine wood and precisely polished. This gift is amazing because it is personalized and it is perfect for every occasion. 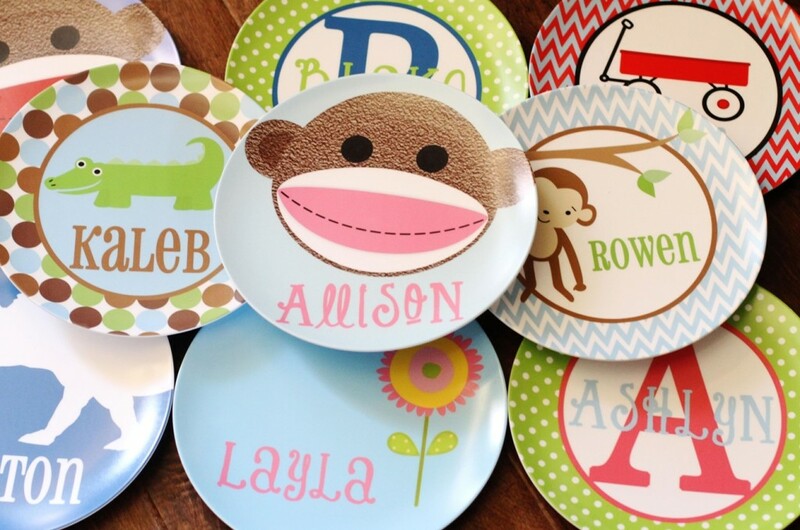 Great personalized plates, and the kids really love them. Also give them as Birthday Gifts and Christmas Gifts. These gifts are amazing because they are personalized. Bedürfen Sie weisen juristische Publikation Professional für der Entwicklung Ihrer Schularbeit in vollem Umfang. The wedding initials puzzles are a personalized way to show you love your friends and family. 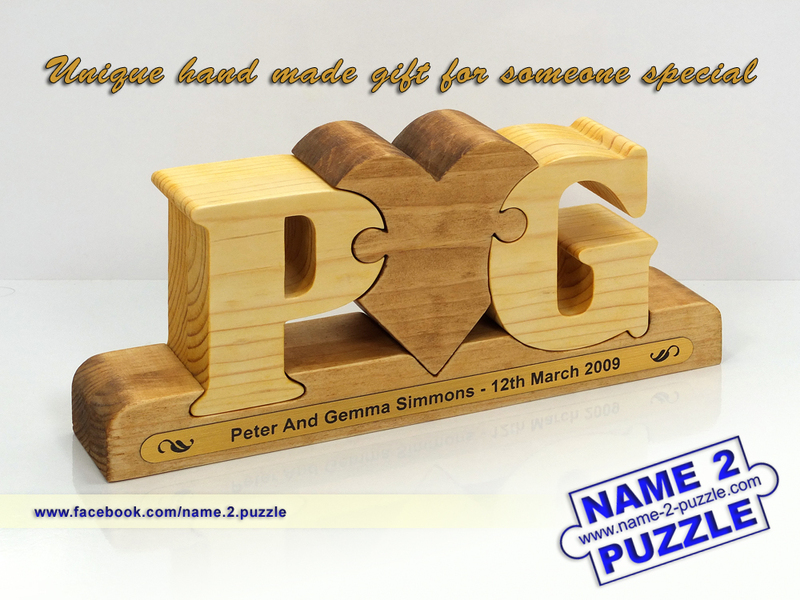 Have the initials of the bride and groom handmade from pine wood. You will surprise them and they will treasure the gift forever. Make their day more special with the wedding initials puzzles. 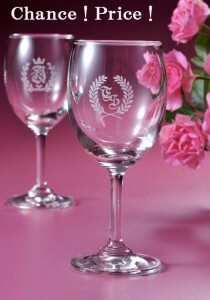 These gifts are perfect for a wedding gift, birthday, wedding anniversary, birth celebrated the 60th birthday celebration, newly-built celebration, gifts for the retirement of a senior citizen’s day, father’s day, mother’s day, midyear, graduation keepsakes, Christmas, Valentine’s day, white day. In this blog you can find various wooden gift ideas. The gifts are an amazing way to show love and respect. 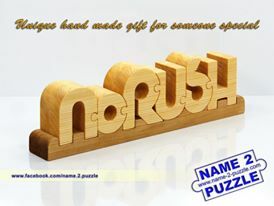 Surprise someone you love by giving him/her one of the many wooden gifts that Name2puzzle offers you. You can find name puzzles, initials puzzles, pen holders and many wedding gifts. The wooden gifts are perfect for every occasion. The original pen and pencil holders which are handmade from pine wood are a great idea for a gift. They are personalized and are perfect for every age and gender and not to mention for every occasion. The gifts are handmade only by order because they are unique and vary in different style and pattern. Every pen and pencil holder is beautiful in its own way.